This post was updated to reflect the new date January 13th. The year began kind of depressing and dreary with the Inauguration of President Trump but we the people prevailed and got through the year. Even with all the negative overtones of the Presidential campaign, Women never lost their voice; making a huge impact in getting out their message of peace and equal rights. As we near the end of the year, we're still going strong, some of us even stronger than before. Women continue to make an impact in business, fashion, entertainment, arts, philanthropy and many more areas of the social scope. So it's only right, that the ladies come together at the top of the new year to speak on their business ventures, lifestyle and what keeps us motivated. 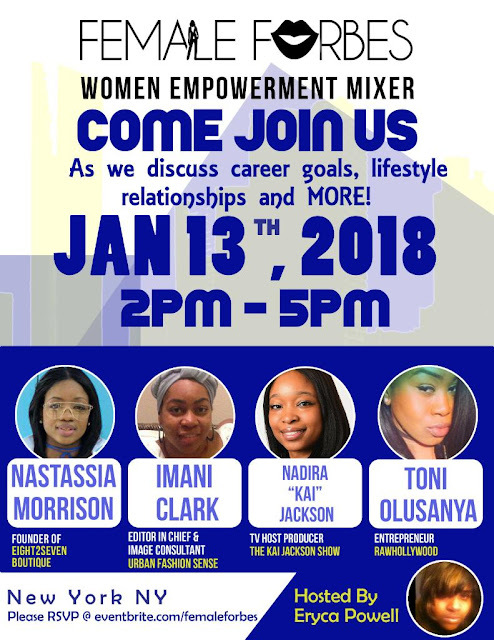 I, Imani Clark the Creator of Urban Fashion Sense Image Consulting Boutique, will be on an all female Women's Empowerment panel and would like women with similar interest to come out and Join Us For Our 1st Annual Women's Empowerment Mixer 'Female Forbes' on January 13, 2018. RSVP to our Eventbrite link for the address.... Let's converse, network and build relationships to start next year off on a positive note. Nastassia Morrison of Eight2Seven Boutique, Nadira 'Kai' Jackson of The Kai Jackson Show and Toni Olusanya of Raw Hollywood will join me on the panel, with Eryca Powell an Associate at CBS moderating our discussion.